Bishop Anthony B. Taylor released the following update, Feb. 8, 2019, following the conclusion of Kinsale Management Consulting’s independent review of clergy personnel files and the diocese’s ongoing internal file review. "On September 10 of last year I wrote you about the steps we are taking to address the clergy sexual abuse crisis in Arkansas. I disclosed the names of 12 priests and former priests against whom credible allegations had been received in the last 70 years. I also announced that an independent review of our clergy files would be undertaken by Kinsale Management Consulting (“Kinsale”). 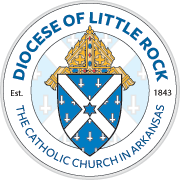 On October 23 I provided an update, stating that since September 10 the Diocese had received reports of additional allegations of clergy sexual abuse from the public — most of which were against priests already listed; none of which were against priests who are currently in active ministry in Arkansas; and all of which were regarding events that would have occurred prior to 2002. ..."
This list is being published as part of the Diocese of Little Rock’s ongoing commitment to transparency and to encourage persons sexually abused by clergy or by anyone working on behalf of the Church to come forward. The individuals named in this list have served in Arkansas at some point in time, but that does not mean that they abused minors during their service here in Arkansas. In addition, although this list includes their assignments, that does not mean that there are allegations of abuse at each place. Despite our best efforts to ensure that this information is accurate and complete, we know that this list may include errors or be incomplete. It was compiled through an initial preliminary internal review of personnel files of clergy whom we already knew or whom we suspected had been credibly accused of child sexual abuse. This initial internal review was followed by an external review by Kinsale Management Consulting, as well as further diocesan investigations and file reviews, which resulted in the addition of two more names of persons credibly accused of sexually abusing minors in Arkansas. An allegation being determined or considered as credible is not the equivalent of a finding of guilt by a jury or judge in a legal proceeding under civil law or canon law, nor does it mean that the allegation is able to be substantiated or proven. The list will be updated in the future based on any new information or investigations, or any additional names provided by other dioceses or religious orders. This is a list of priests from other dioceses who have been credibly accused of child sexual abuse in Arkansas. This is a list of religious order priests and brothers who have been credibly accused of child sexual abuse in Arkansas. This is a list of priests who have been credibly accused outside of Arkansas, but who served in Arkansas at some point. Resided at Marylake Monastery in Arkansas (1992-1997), but conducted no public ministry while in residence in Arkansas.